On Friday, we revealed that Cardi B’s ex fling Swift on Demand was dating a new female rapper. Now that you know it’s aspiring MC K Goddess, we got some tea to spill. 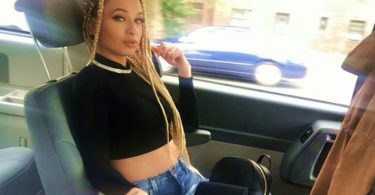 CelebNReality247.com has learned that K Goddess, the Brooklyn born rapper has no time for fake ones, or stalkers, especially some b—-h who is no longer in Swift’s life. 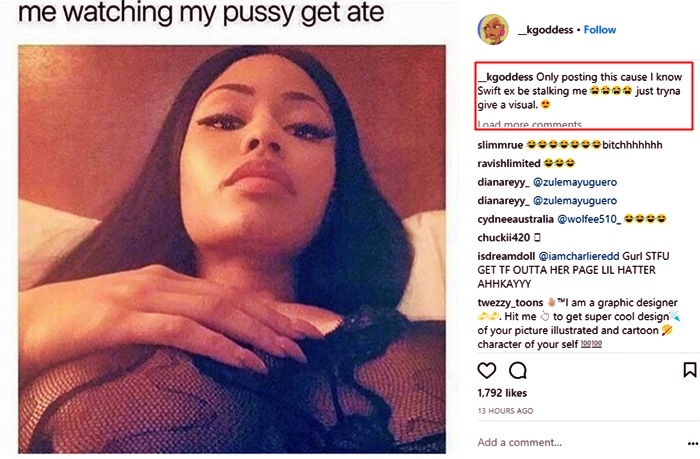 Apparently, this woman has been on attack mode now that Swift has picked up the pieces and moved on from Asia Cole with his music investing his time and efforts in K Goddess. After he aired Asia Cole’s dirty laundry, she responded to the claims calling him a liar. It appears Asia isn’t over Swift, so now she’s gunning for his new girlfriend K Goddess. Swift and K Goddess have been together for sometime now, and they’ve been grinding hard on new music. She’s already announced there is a mixtape on the way. And it ain’t whack like Joseline Hernandez diss track at Cardi B.
Nah, K seem to have her spit tight, she’s posted a few freestyles and we have to admit the shhh be banging. Our question is why isn’t K Goddess and Swift on Love & Hip Hop 8? Who is Cardi B’s Ex-Fling Swift Dating?